Squeezed between the larger Rogue and smaller Kicks, the Rogue Sport struggles to justify its price and purpose. No automaker is riding the wave of SUV popularity harder than Nissan. The brand currently sells no less than six utility vehicles, from the diminutive Kicks up to the behemoth Armada. The 2019 Rogue Sport slots in right above the brand’s aforementioned smallest crossover and below the uber-popular Rogue. ⠀ 2017 Nissan Rogue Sport | Why Buy? Whether or not you should buy a Rogue Sport is really a question of whether or not you should buy the less expensive Kicks or more useful Rogue instead. For those who can’t decide, perhaps the Rogue Sport is a perfect compromise. For us, though, the other two SUVs were designed with clearer purposes in mind. The Nissan Rogue Sport is priced a bit on the high side among sub-compact crossover SUVs. Its base price for a two-wheel-drive model is $22,100 – a good bit more than competitors like the Honda HR-V ($20,520), Mazda CX-3 ($20,390), and Mitsubishi Outlander Sport ($20,945). At the other end of the price spectrum, the top-of-the-line Rogue Sport SL AWD I tested had an as-tested price of $31,780. Subcompact SUVs rarely top $30K in price, but this one did, and not by a little. For comparison’s sake, consider the 2019 Subaru Crosstrek, which has a similar base price to the Rogue Sport at $21,895, though comes with all-wheel drive standard, not extra. Fully loaded, the Crosstrek offers more features than the Rogue Sport, and yet costs less at $30,250. 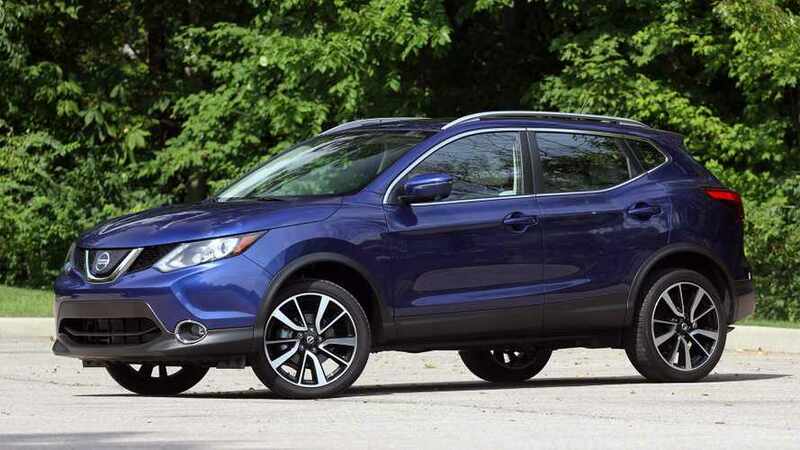 The Rogue Sport is a handsome little crossover, with proportions that match larger SUVs at a slightly smaller scale. For people who don’t like how some subcompact SUVs eschew all pretense of ruggedness and utility in favor of quirky design cues, the Rogue Sport’s mature and conservative design is appealing. Plus, its traditional SUV shape affords a larger cargo area than its trendy competitors, with a maximum capacity of 61.1 cubic feet when the rear seats are folded forward. I also happen to prefer the Rogue Sport’s styling to its larger sibling, the compact-sized Rogue. The Rogue Sport’s dimensions are lower and more car-like – like a quasi-hatchback or sport wagon – compared to the higher-riding and taller Rogue. The Rogue Sport’s interior is appropriate for an affordable crossover SUV priced in the low- to mid-$20K range, but it feels cheap and lacking for something costing nearly $32K. As you’d expect, there are a lot of hard plastics, which would be easy to forgive if a few touch points were more pleasant. My right knee, for instance, rested solely against the rigid cover of the center console, and was beat up by the constant contact made over a long trip. In terms of roominess, front passengers are well served with more than enough space for average bodies to fit comfortably. The rear seat, however, is tight, with deep footwells that make entering and exiting with grace a challenge. As mentioned, the Rogue Sport’s cargo capacity is impressive for this type of vehicle. It also offers a completely flat floor when its rear seats are folded – a rarity in small SUVs – and multiple configurations to both secure and hide your cargo. Being affordable, the Rogue Sport doesn’t have a lot of sound deadening or trick technology to keep noise and vibrations at bay. That said, its noise, vibration, and harshness levels are no worse than typical sub-compact SUVs. The Rogue Sport, particularly when fully loaded like my SL AWD tester, offers a lot of infotainment technology for the money, but it’s just not very good. NissanConnect with Navigation comes standard on the SL AWD and includes a seven-inch touchscreen with voice control and SiriusXM satellite radio. However, it’s an old system with dated graphics and so-so speed. To make matters worse, Apple CarPlay and Android Auto are not available to bypass the onboard systems. There are lots of other tech and amenities that come with the loaded SL AWD model: things like push-button start, proximity keys for easily unlocking doors, and remote engine start. Yet there’s nothing here that’s innovative or rises to the level of gotta-have-it – just a full suite of features you’d expect to get in a modern, loaded vehicle. Nissan only offers one engine for the Rogue Sport: a 2.0-liter four-cylinder engine producing 141 horsepower and 147 pound-feet of torque. As with many Nissans, transmission duties are handled by a continuously variable unit instead of traditional gears. Fortunately, Nissan has had a lot of time to perfect CVTs, and the Rogue Sport’s is largely invisible and even mimics the feel of actual gear changes sometimes. That relatively small amount of power is average among subcompact crossovers. It doesn’t afford much in the way of spirited performance, but it’s enough to avoid the dreaded “underpowered” adjective. If you had hopes of towing anything, though, consider them dashed; like many of its competitors, the Rogue Sport isn’t rated to tow so much as a feather. Safety is an area where the Rogue Sport excels. Every Rogue Sport comes standard with automatic emergency braking, blind-spot warning, and rear cross-traffic alert – a rarity in the class. Kudos to Nissan for democratizing these advanced safety features. The SL model with all-wheel drive, meanwhile, can be had with an optional $1,990 Premium Package that also adds LED low and high-beam headlights with high-beam assist, lane-departure warning, lane-keep assist, and a more capable automatic emergency braking system with pedestrian detection. Even without this package, though, the Rogue Sport offers a high level of accident avoidance systems across its entire model line. The Environmental Protection Agency rates the Nissan Rogue Sport with all-wheel drive at 24 miles per gallon in the city, 30 on the highway, and 27 combined. That puts it a bit behind most direct competitors. For instance, the Subaru Crosstrek and Mazda CX-3 are both rated at 29 mpg combined, while the updated 2019 Honda HR-V is rated at 28 mpg combined. Fortunately, only regular gasoline is required.